An impressive move into somewhat serious territory for director Todd Phillips, (the Hangover trilogy,) this one turns out to be incredibly lively and interesting. A movie that surprisingly turns out to be pretty damn good. This one is not a comedy like you might expect from the director, (the Hangover movies.) Instead, it is more of a drama, in the same vein as The Wolf of Wall Street, complete with back stabbing, illegal dealings, and some very dangerous situations. Miles Teller plays the everyman who we follow along on this fish out water story, as he joins his friend in the arms business. That friend, played by Jonah Hill, is the character who steals the show. He’s a bit of a nut and a hell of a lot of fun to watch. This movie has some very dark turns and these just make the story all the more interesting. There are definitely paths it takes that feel familiar, but it’s the character transformations and reveals that really drive this thing home. War Dogs is a movie that is shockingly way better than it would seem. 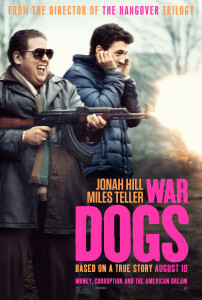 Here you have a movie that is directed by Todd Phillips (Road Trip, Old School, and the Hangover movies,) and stars Jonah Hill. So right off the bat, you’re thinking comedy. And the arms dealing plot doesn’t exactly peak a whole lot of interest. After all, the last time we got a mainstream movie on this topic was with Lord of War, a Nicolas Cage movie, back when he was still an actor of relevance. So going in, this movie doesn’t generally garner good feelings or expectations. And that’s what makes the film such a surprise. The comedy element is all a smoke screen or disguise. War Dogs is not a comedy. There might be occasional humorous elements, such as how ridiculous some of the things our character get involved in are, but that’s about it. Otherwise, this is a drama all the way, not far off from something like The Wolf of Wall Street. With that movie, Jonah Hill was Oscar nominated. Considering this movie has the same tone, feel, and approach, it makes him pretty perfect for this one. In The Wolf, Hill took a back seat to DiCaprio. 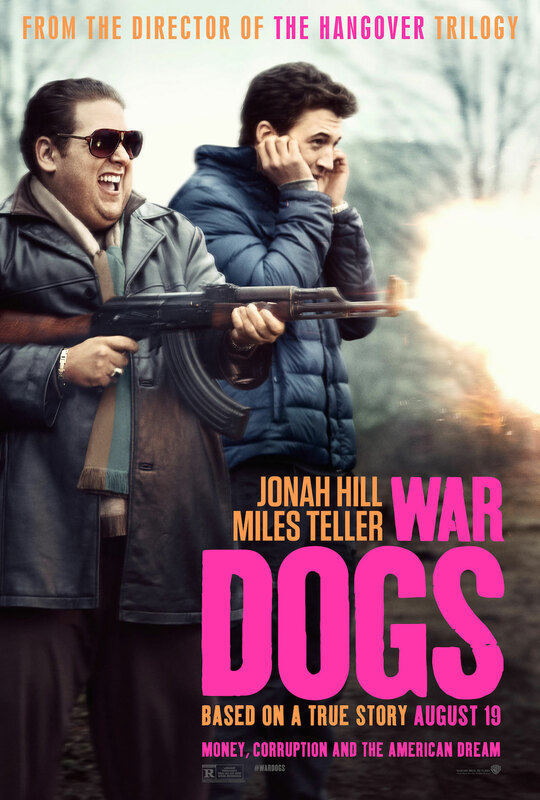 With War Dogs, he might not be the protagonist, but he certainly steals the show. Hill is by far the most interesting and personable character on screen here. He’s also the craziest and the most fun. The protagonist of the movie is David Packouz (Miles Teller,) a guy who lives down in Miami as a professional masseuse, dealing with old men who intentionally let their towels drop on the floor. We see this sort of thing at the start of the film, accompanied by David’s voice over about how much he hates his job, and dreams big about doing something else. David is the regular guy of the movie. He’s the more subdued character who we are supposed to relate to. And we do. 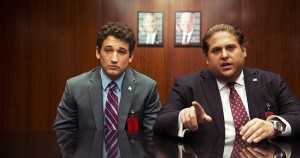 Especially when compared to Jonah Hill’s character. Miles Teller is good in the role. He doesn’t seem to be an especially great actor, and really hasn’t branched out from playing this kind of thing, but he definitely does it well. It’s basically the same kind of role he played in Whiplash, which was Teller’s breakout movie. Here his character, David, has a plan. The plan is to buy up some high quality, Egyptian bed sheets, and sell them at a discounted rate to old age retirement homes. David thinks the residents will really appreciate thes quality of these, and he will be able to sell them at a good price to the managements of the homes, while still making a profit. David spends his life savings on this, buying boxes and boxes of the sheets, considering it a major investment that will pay off. Only it doesn’t. As it happens, David quickly learns that no old age home is interested. They say the skin on the residents is so wrinkled and scale-like, that most of these people will never even know the difference between the types of sheets they might be laying on. And that puts David in quite a hole. This is pretty much where David is when we meet Efraim Diveroli, (Hill.) David and Efraim were best friends back in high school, but have long since lost touch. Efraim moved to California to start working with his uncle, dealing in the arms trade. Apparently there was a falling out between the two of them, and Efraim left. Now he’s back home in Miami, and runs into David at a funeral. The two of them start talking and end up leaving the funeral together to go hang out. Efraim tells David a little bit about what he does, and then gives an unexpected impromptu demonstration when he goes to buy drugs and gets ripped off. With David in the car, watching the whole thing, Efraim pulls a machine gun out of the trunk and starts firing it off into the air. Pretty soon David and Efraim are working together. David has got a beautiful wife at home, Iz, (played by Ana De Armas from Knock Knock,) and she is pregnant. Considering how much money he lost on those bed sheets, David needs an opportunity fast, and when one presents itself in the form of Efraim, he jumps on board. And the two of them go to get started. Only David has to lie to Iz about what he’s doing. He tells her that he’s using Efraim’s connections to sell the bed sheets. His reason for lying is because his wife really hates the war, and would be adamantly against this entire thing. The movie does a nice job of presenting David’s desperation, through the major loss of the bed sheet situation, as well as his desire to do something big and get out of the masseuse business. Efraim puts David through a crash course of how the arms trade business works, and it’s actually pretty interesting. We, the audience, take on David’s fish out of water point of view., and learn everything right alongside of him. Apparently The U.S. government posts contracts on a website of orders that they need filled of specific types of guns and the amounts they need . Then independent contractors bid on these orders. All of the big contracts are taken by huge companies and manufacturers, but the little ones get overlooked. And if someone takes enough small contracts, then together these are actually worth a whole lot of money. There’s just one problem. If you accept a contract and then can’t deliver, you get blacklisted by the U.S. government and they stop working with you all together. This comes into effect with an order that David and Ephraim are trying to meet, which gets held up due to a flight restriction and embargo between two countries. David and Ephraim have to fly to the location in the Middle East where the guns are being held, and then drive them across the border themselves, on a route that takes them through an area known as the triangle of death. It’s an exciting scene and only the first of their challenges. This is the mission that puts the two of them on the map. Suddenly they have a reputation and working relationship with a top U.S. general, and it leads them to getting bigger and bigger deals. The two of them now start building up their offices and hiring people to come work for their company. With that first major mission, David and Efraim risked their lives. With the next one, they risk their values. This time the situation involves going through an arms dealer who is on a U.S. terrorist watch list (a decent role and character, played by Bradley Cooper,) and then having to repackage ammunition so that nobody can tell which country it came from. The whole thing comes from the boys agreeing to a contract and paying for this ammo before they really where it came from. The U.S. does not use Chinese ammunition and that’s exactly what David and Ephraim have just bought. So they start dressing it up to look like something it’s not, and break a ton of laws in the process. This is where the boys start to go down a very dark path, and it leads to such things as kidnapping and being held at gunpoint. It’s also where the movie starts to go from good to great. The second half of the film is what really takes off. If the first half was all setup and establishing how things in the business worked, as well as why David might join up with it, then the second half is all about the delivery. David and Ephraim face the inevitable conflict that you would expect, only it’s a thousand times darker than one might have imagined. Characters reveal their true colors, and these turn out to be pretty substantial and game-changing. This movie works on all sorts of levels. It tells a fresh and original story and does so through some very tense and interesting situations. Some of the plot points might feel familiar, (the ending feels right out of Goodfellas or Casino,) but what this movie does with character, and with Hill’s character, Efraim, in particular, is pretty great. It’s definitely a worthwhile film, and for director Todd Phillips, it’s a nice feather in his cap.